In November 2012 Voce was approached by international rock legend Mick Jagger. He was looking for a choir to perform live as part of The Rolling Stones' 50th anniversary transatlantic tour: could Voce help? Too right we could! Together with choral scholars from the London Youth Choir and armed with a cracking arrangement by composer Toby Young, Voce took to the stage on two dates at London's O2 arena to perform the Stones' hit You Can't Always Get What You Want to a combined audience of 40,000. Since then, footage of our performances has been viewed online by tens of thousands of people all around the world. What a gig. From the top-secret rehearsals at Wembley Arena to the sound checks in a deserted O2, and from the pre-performance backstage nerves to standing on stage grinning at thousands of new fans - this was a concert to remember. 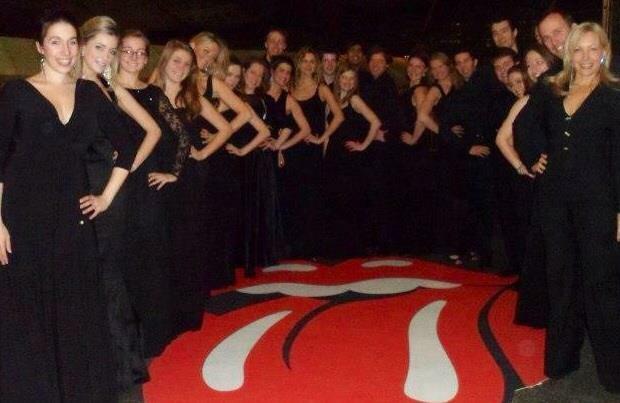 Voce performed live with The Rolling Stones at the London O2 on 25 and 29 November 2012. Check out some of our singers' photos and videos from the concerts - and our feature in the Independent.